Mazda Takeri first show was held in Tokyo a few months. The car is a concept of a new generation Mazda6, so that the interest in him is very high. It will be offered in four versions of the body - sedan, hatchback, wagon and coupe. 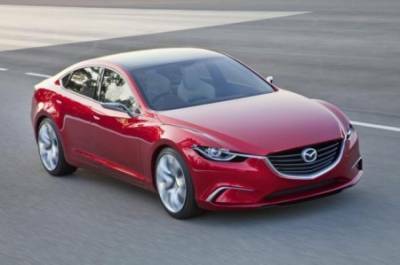 While it is impossible to tell which engine to get the updated Mazda6, but on the whole family can boast of a system SkyActiv. Concept Takeri just fitted a diesel engine with a power line SkyActiv 173 hp and the volume of 2.2 liters. It works together with the 6-speed automatic transmission. Of the features worth mentioning recuperative braking system i-ELOOP (Intelligent Energy Loop), which will reduce fuel consumption. The new generation Mazda6 will be available in 2013.